Bladder cancer (BC) is a major social and financial burden and is the ninth most common cancer and the thirteenth most common cause of cancer deaths worldwide. In the United States, over 79,000 new cases of BC were estimated to be diagnosed in 2017, with an estimated 16,870 deaths due to the disease. In Taiwan, BC is the ninth most common cancer among men according to the Taiwan Cancer Registry Annual Report for 2014. Currently, cystoscopy and biopsy are primary procedures used to diagnose BC. Conventional parameters, such as tumor grade, stage, and vascular and lymphatic extension, are used as prognostic indicators for BC. However, the currently used prognostic indicators have a limited ability to predict tumor recurrence, progression, metastasis, response to therapy, or survival. After the primary treatment of BC, a long-term follow-up is necessary to prevent BC recurrence. Present follow-up protocols entail the use of urethrocystoscopy, which is the gold standard, and urine cytology to detect tumor recurrence early. Ongoing surveillance generally consists of performing a cystoscopy every 3 months for 2 years, then every 6 months for 2 years, and finally annually, assuming no recurrence. The systemic treatment of BC has been limited to cisplatin-based chemotherapy. For decades, the overall survival rate of 50% at 5 years for muscle-invasive BC has not improved. The use of precision medicine and immunotherapy to treat advanced stages of BC represents a breakthrough; however, more attention should be focused on individual variations of the disease. Therefore, researchers are attempting to analyze molecular alterations that occur in BC to develop novel treatment approaches. Autophagy means self-eating and is a ubiquitous process in eukaryotic cells; autophagy is the mechanism through which these cells respond to stress conditions and result in the digestion of the cytoplasm within lysosomes. Through autophagy, cells adapt to environmental or developmental changes. Accumulating evidence has suggested that autophagy is involved in key aspects of tumor progression such as primary tumor initiation, expansion, invasion, metastasis, and resistance to therapy. Under conditions of hypoxia and nutrient deprivation, autophagy induction provides critical building blocks and causes energy regeneration that enables the survival of tumor cells. Autophagy ensures the metabolic fitness of cancer cells during intravasation and invasion, prolongs the survival of tumor cells during tumor dormancy, and helps tumor cells to adapt to a distant tissue microenvironment during metastasis. The survival of tumor stem cells is promoted by autophagy that is induced in response to acute stresses such as chemotherapy and radiation. Therefore, autophagy provides a survival advantage to cancer cells during anticancer treatment. In 2016, we found that BC cell lines and tissues exhibited a high basal level of autophagy. Inhibition of basal autophagic activities through treatment with chloroquine or hydroxychloroquine, two well-known autophagy inhibitors, increased the apoptotic cell death of BC cells. Moreover, inhibition of drug-induced autophagy potentiated the cytotoxic effects of cisplatin and RAD001, a specific mammalian target of rapamycin (mTOR) complex 1 (mTORC1) inhibitor., Collectively, our study results demonstrated that autophagy is critical for the survival of BC cells and that either the basal or drug-induced inhibition of autophagy improves the therapeutic effects of chemotherapeutic agents against BC. Autophagy in BC is, therefore, considered to be a novel therapeutic target. MicroRNAs (miRNAs) are a class of noncoding small RNAs that are expressed endogenously and regulate gene expression posttranscriptionally. In association with the RNA-induced silencing complex (RISC), miRNAs bind to regions located mainly within the 3′-untranslated regions of target messenger RNA (mRNA) through partial complementarity and guide the RISC to interrupt protein translation or induce mRNA degradation. miRNAs play a critical role in biological processes, such as proliferation, differentiation, stress response, and cell death, through the regulation of their targeted genes. In human cancers, miRNAs can function as a tumor suppressor or an oncogene by repressing oncogenic or tumor-suppressing mRNAs, respectively. Therefore, the regulation of tumorigenesis by miRNAs spans the phases of initiation, progression, metastasis, and treatment sensitivity. Furthermore, a single miRNA can simultaneously target a multitude of mRNA molecules and biological networks, presenting a clear advantage from a clinical point of view. Extensive research is presently focused on developing a miRNA-based therapeutic strategy for cancer treatment. For example, a recent study conducted by our group showed that several dysregulated miRNAs identified using BC tissues from Taiwanese patients regulate multiple components involved in the signaling of the insulin-like growth factor type I receptor (IGF1R) pathway. IGF1R overexpression in BC was reported to be associated with cancer-specific mortality. More recently, miR-539 was demonstrated to inhibit the proliferation and invasion of BC cells through the regulation of IGF1R. Targeting the IGF1R signaling pathway by restoring downregulated miRNAs in BC should be considered a novel approach that warrants further investigation. miRNAs play a key role in autophagy. In this review, we summarize current studies evaluating the contribution of dysregulated miRNAs to the regulation of autophagy induction in bladder tumor samples. We analyzed aberrantly expressed BC-related miRNAs and their validated or potential target genes involved in the core autophagy pathway. In this way, we determined that multiple dysregulated miRNAs participate in every step of the autophagy process, possibly enabling the survival of cancer cells and facilitating chemotherapeutic resistance. Twenty-three years after its initial discovery, the significance of autophagy was recognized with the Nobel Prize in Physiology and Medicine in 2016. Extensive research efforts have been made to expand the fundamental understanding of autophagy with respect to basic biology and human diseases such as cancer. Autophagy is an evolutionarily conserved cellular catabolic process that eliminates proteins and organelles through their delivery to lysosomes. The process of autophagy is initiated by the formation of double-membrane autophagic vacuoles (autophagosomes) in cytoplasmic components. During the last decade, many key genes and pathways involved in the process and regulation of autophagy have been identified. More than 30 genes are now identified and categorized in the autophagy-related gene (ATG) family, including ATG1, ATG4, LC3/ATG8, ATG13, and beclin-1 (BECN1). [Figure 1] illustrates how the inhibition of mTOR in mammalian cells by starvation or another stress condition leads to the activation of autophagy-initiation kinases, namely, Unc-51-like autophagy-activating kinase 1 and 2 (ULK1 and ULK2, respectively), which phosphorylate downstream ATG13 and FIP200, forming a ULK1 complex. The ULK1 complex, essential for the initiation of autophagy, is subsequently recruited to the phagophore assembly site. The class III PI3K complex constituted by BECN1, Vps34, ATG14, and AMBTA is essential for vesicle nucleation. Formation of the ATG5, ATG12, and ATG16 complex promotes the elongation of the phagophore. 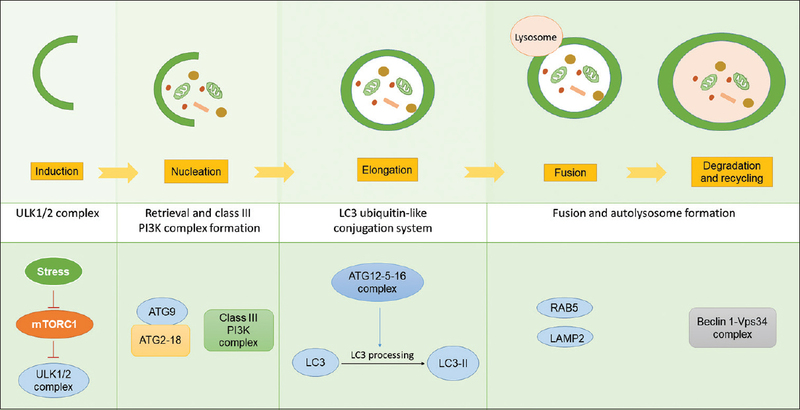 The LC3 ubiquitin-like conjugation system also promotes phagophore elongation. After the formation of the mature autophagosome, it fuses with the lysosome and degrades its contents. The first report concerning a set of miRNAs that are dysregulated in BC was published in 2007. The authors used a homemade oligonucleotide microchip for miRNA profiling, compared the expression of miRNAs in 27 bladder specimens that included 25 urothelial carcinomas and two normal mucosa, and found that miR-223, miR-26b, miR-221, miR-103-1, miR-185, miR-23b, miR-203, miR-17-5p, miR-23a, and miR-205 were significantly upregulated in BC. Since then, hundreds of miRNAs have been found to be downregulated, overexpressed, or otherwise aberrantly expressed in BC. The role a particular miRNA in BC is reflected in its differential expression, and the function of a particular miRNA depends on its target genes. Therefore, downregulated miRNAs that target tumor suppressor genes are considered to be onco-miRNAs, and upregulated miRNAs that target oncogenes are considered to be tumor-suppressing miRNAs. For example, a study compared 156 miRNA expression signatures among 14 BC tissues, five normal bladder urothelial samples, and three BC cell lines and found that the expression of four miRNAs (miR-30a-3p, miR-133a, miR-195, and miR-199a-3p) that usually act as tumor suppressors was downregulated in tumors. By contrast, other miRNAs, such as miR-21 and miR-200c, that are clearly upregulated in clinical BC tissues may promote the development or progression of BC., The expression profiles of miRNAs, which are detected using either microarray or deep sequencing technologies, in BC have been documented in numerous investigations by using various types of samples obtained from clinical tissue specimens, body, fluids, and BC cell lines.,, Because autophagy occurs inside cells, we focused on dysregulated miRNAs in BC tissue samples. A global review of the current literature describing the signatures of miRNAs in BC was undertaken to gain insights into how dysregulated miRNAs participate in autophagy regulation. Eighty-two articles published between January 2005 and April 2018 were retrieved by searching for the MESH terms “bladder cancer,” “miRNA,” and “review.” Review articles and their relevant references were reviewed, and we compared and summarized findings concerning miRNAs that were reported to be aberrantly expressed in BC tissues [Table 1]; miRNAs that were reported to be dysregulated in a single publication or determined to be dysregulated on the basis of BC cell lines were excluded. The results of our previous study that explored dysregulated miRNAs in samples of BC patients accorded with the results of the retrieved studies. Common dysregulated miRNAs identified in both our study and other reports are highlighted with an asterisk in [Table 1]. During the process of vesicle elongation and completion, numerous miRNAs participate in modulating the expression of ATG12-5-16 components such as miR-106b, miR-23b, and miR-30a.,, The other ubiquitin-like protein conjugation system responsible for vesicle elongation is LC3, and ATG4 proteins and ATG7-3 are required for LC3-II formation. A report indicated that miR-101 targets ATG4 to inhibit autophagy. The miRNAs miR-423 and miR-199a have been demonstrated to promote autophagy and regulate chemoresistance by targeting ATG7,, and miR-204 was determined to cease the activation of LC3-II, exerting a similar effect in this process. To date, novel therapeutic approaches have consisted of personalization, molecular targeting, and immunotherapy for improving survival and prognosis in BC. Numerous studies have demonstrated that aberrantly expressed miRNAs contribute to BC progression by acting as oncogenes or tumor suppressors. Recent reports have indicated that the noninvasive detection of miRNAs from body fluids, such as blood and urine of BC patients, can be used to improve diagnosis, prognosis, or even predict recurrence. Therefore, the identification of dysregulated miRNAs to develop clinical applications in BC is crucial. Autophagy is implicated in multiple steps of cancer progression, and the body of evidence concerning the dysregulation of autophagy-related miRNAs in cancer has grown considerably. Thus far, approximately 400 miRNAs have been validated as having or predicted to have interactions related to autophagy. Our previous study discovered various dysregulated miRNAs in BC, some of which play key roles in autophagy regulation. For example, our previous findings indicated that miR-99a-5p acted as a tumor suppressor through targeting mTOR in BC., Furthermore, miR-30a-5p increased drug sensitivity to cisplatin by targeting ATG5 and Beclin-1 in BC. Therefore, we forced expression of these miRNAs to improve BC treatment, and our preliminary results demonstrated a promising effect of these miRNAs in BC therapy. Additional efforts are necessary to evaluate the therapeutic roles of candidate miRNAs. Finally, future studies are necessary to further elucidate novel RNA networks in BC cells and discover miRNA information related to autophagy. Taiwan Cancer Registry Annual Report2014 2018. Habuchi T, Marberger M, Droller MJ, Hemstreet GP, 3rd, Grossman HB, Schalken JA, et al. Prognostic markers for bladder cancer: International Consensus Panel on bladder tumor markers. Urology 2005;66:64-74. Goodison S, Rosser CJ, Urquidi V. Bladder cancer detection and monitoring: assessment of urine- and blood-based marker tests. Molecular diagnosis & therapy 2013;17:71-84. Mizushima N, Yamamoto A, Matsui M, Yoshimori T, Ohsumi Y. In vivo analysis of autophagy in response to nutrient starvation using transgenic mice expressing a fluorescent autophagosome marker. Mol Biol Cell 2004;15:1101-11. Jin S, White E. Role of autophagy in cancer: management of metabolic stress. Autophagy 2007;3:28-31. Brech A, Ahlquist T, Lothe RA, Stenmark H. Autophagy in tumour suppression and promotion. Mol Oncol 2009;3:366-75. Sharifi MN, Mowers EE, Drake LE, Collier C, Chen H, Zamora M, et al. Autophagy Promotes Focal Adhesion Disassembly and Cell Motility of Metastatic Tumor Cells through the Direct Interaction of Paxillin with LC3. Cell Rep 2016;15:1660-72. Martinez-Outschoorn UE, Whitaker-Menezes D, Pavlides S, Chiavarina B, Bonuccelli G, Casey T, et al. The autophagic tumor stroma model of cancer or “battery-operated tumor growth”: A simple solution to the autophagy paradox. Cell Cycle 2010;9:4297-306. Lin JF, Lin YC, Tsai TF, Chen HE, Chou KY, Hwang TI. Cisplatin induces protective autophagy through activation of BECN1 in human bladder cancer cells. Drug Des Devel Ther 2017;11:1517-33. Vannini I, Fanini F, Fabbri M. Emerging roles of microRNAs in cancer. Curr Opin Genet Dev 2018;48:128-33. Tsai T-F, Lin Y-C, Chen H-E, Chou K-Y, Lin J-F, Hwang TIS. Involvement of the insulin-like growth factor I receptor and its downstream antiapoptotic signaling pathway is revealed by dysregulated microRNAs in bladder carcinoma. Urological Science 2014;25:58-64. Gonzalez-Roibon N, Kim JJ, Faraj SF, Chaux A, Bezerra SM, Munari E, et al. Insulin-like growth factor-1 receptor overexpression is associated with outcome in invasive urothelial carcinoma of urinary bladder: a retrospective study of patients treated using radical cystectomy. Urology 2014;83:1444 e1-6. Liao G, Chen F, Zhong J, Jiang X. MicroRNA539 inhibits the proliferation and invasion of bladder cancer cells by regulating IGF1R. Mol Med Rep 2018;17:4917-24. Zhai H, Fesler A, Ju J. MicroRNA: a third dimension in autophagy. Cell Cycle 2013;12:246-50. Levine B, Klionsky DJ. Autophagy wins the 2016 Nobel Prize in Physiology or Medicine: Breakthroughs in baker's yeast fuel advances in biomedical research. Proc Natl Acad Sci U S A 2017;114:201-5. Tsukada M, Ohsumi Y. Isolation and characterization of autophagy-defective mutants of Saccharomyces cerevisiae. FEBS Lett 1993;333:169-74. Klionsky DJ, Abdelmohsen K, Abe A, Abedin MJ, Abeliovich H, Acevedo Arozena A, et al. Guidelines for the use and interpretation of assays for monitoring autophagy (3rd edition). Autophagy 2016;12:1-222. Fullgrabe J, Klionsky DJ, Joseph B. The return of the nucleus: transcriptional and epigenetic control of autophagy. Nat Rev Mol Cell Biol 2014;15:65-74. Kang R, Zeh HJ, Lotze MT, Tang D. The Beclin 1 network regulates autophagy and apoptosis. Cell Death Differ 2011;18:571-80. Yu ZQ, Ni T, Hong B, Wang HY, Jiang FJ, Zou S, et al. Dual roles of Atg8-PE deconjugation by Atg4 in autophagy. Autophagy 2012;8:883-92. He C, Klionsky DJ. Regulation mechanisms and signaling pathways of autophagy. Annu Rev Genet 2009;43:67-93. Gottardo F, Liu CG, Ferracin M, Calin GA, Fassan M, Bassi P, et al. Micro-RNA profiling in kidney and bladder cancers. Urol Oncol 2007;25:387-92. Ichimi T, Enokida H, Okuno Y, Kunimoto R, Chiyomaru T, Kawamoto K, et al. Identification of novel microRNA targets based on microRNA signatures in bladder cancer. Int J Cancer 2009;125:345-52. Cheng Y, Zhang X, Li P, Yang C, Tang J, Deng X, et al. MiR-200c promotes bladder cancer cell migration and invasion by directly targeting RECK. Onco Targets Ther 2016;9:5091-9. Zhang HH, Qi F, Cao YH, Zu XB, Chen MF. Expression and clinical significance of microRNA-21, maspin and vascular endothelial growth factor-C in bladder cancer. Oncol Lett 2015;10:2610-6. Han Y, Chen J, Zhao X, Liang C, Wang Y, Sun L, et al. MicroRNA expression signatures of bladder cancer revealed by deep sequencing. PLoS One 2011;6:e18286. Tolle A, Jung M, Rabenhorst S, Kilic E, Jung K, Weikert S. Identification of microRNAs in blood and urine as tumour markers for the detection of urinary bladder cancer. Oncol Rep 2013;30:1949-56. Yao D, Jiang Y, Gao S, Shang L, Zhao Y, Huang J, et al. Deconvoluting the complexity of microRNAs in autophagy to improve potential cancer therapy. Cell proliferation 2016;49:541-53. Wu H, Wang F, Hu S, Yin C, Li X, Zhao S, et al. MiR-20a and miR-106b negatively regulate autophagy induced by leucine deprivation via suppression of ULK1 expression in C2C12 myoblasts. Cell Signal 2012;24:2179-86. Wang Z, Wang N, Liu P, Chen Q, Situ H, Xie T, et al. MicroRNA-25 regulates chemoresistance-associated autophagy in breast cancer cells, a process modulated by the natural autophagy inducer isoliquiritigenin. Oncotarget 2014;5:7013-26. John Clotaire DZ, Zhang B, Wei N, Gao R, Zhao F, Wang Y, et al. MiR-26b inhibits autophagy by targeting ULK2 in prostate cancer cells. Biochem Biophys Res Commun 2016;472:194-200. Li S, Qiang Q, Shan H, Shi M, Gan G, Ma F, et al. MiR-20a and miR-20b negatively regulate autophagy by targeting RB1CC1/FIP200 in breast cancer cells. Life sciences 2016;147:143-52. Qased AB, Yi H, Liang N, Ma S, Qiao S, Liu X. MicroRNA-18a upregulates autophagy and ataxia telangiectasia mutated gene expression in HCT116 colon cancer cells. Molecular medicine reports 2013;7:559-64. Huang N, Wu J, Qiu W, Lyu Q, He J, Xie W, et al. MiR-15a and miR-16 induce autophagy and enhance chemosensitivity of Camptothecin. Cancer Biol Ther 2015;16:941-8. Chatterjee A, Chattopadhyay D, Chakrabarti G. miR-17-5p downregulation contributes to paclitaxel resistance of lung cancer cells through altering beclin1 expression. PLoS One 2014;9:e95716. Zhu H, Wu H, Liu X, Li B, Chen Y, Ren X, et al. Regulation of autophagy by a beclin 1-targeted microRNA, miR-30a, in cancer cells. Autophagy 2009;5:816-23. He J, Yu JJ, Xu Q, Wang L, Zheng JZ, Liu LZ, et al. Downregulation of ATG14 by EGR1-MIR152 sensitizes ovarian cancer cells to cisplatin-induced apoptosis by inhibiting cyto-protective autophagy. Autophagy 2015;11:373-84. Xu N, Zhang J, Shen C, Luo Y, Xia L, Xue F, et al. Cisplatin-induced downregulation of miR-199a-5p increases drug resistance by activating autophagy in HCC cell. Biochem Biophys Res Commun 2012;423:826-31. Kovaleva V, Mora R, Park YJ, Plass C, Chiramel AI, Bartenschlager R, et al. miRNA-130a targets ATG2B and DICER1 to inhibit autophagy and trigger killing of chronic lymphocytic leukemia cells. Cancer Res 2012;72:1763-72. Huang J, Sun W, Huang H, Ye J, Pan W, Zhong Y, et al. miR-34a modulates angiotensin II-induced myocardial hypertrophy by direct inhibition of ATG9A expression and autophagic activity. PLoS One 2014;9:e94382. Zhai Z, Wu F, Chuang AY, Kwon JH. miR-106b fine tunes ATG16L1 expression and autophagic activity in intestinal epithelial HCT116 cells. Inflammatory bowel diseases 2013;19:2295-301. Wang P, Zhang J, Zhang L, Zhu Z, Fan J, Chen L, et al. MicroRNA 23b regulates autophagy associated with radioresistance of pancreatic cancer cells. Gastroenterology 2013;145:1133-43 e12. Yu Y, Cao L, Yang L, Kang R, Lotze M, Tang D. microRNA 30A promotes autophagy in response to cancer therapy. Autophagy 2012;8:853-5. Frankel LB, Wen J, Lees M, Hoyer-Hansen M, Farkas T, Krogh A, et al. microRNA-101 is a potent inhibitor of autophagy. EMBO J 2011;30:4628-41. Stiuso P, Potenza N, Lombardi A, Ferrandino I, Monaco A, Zappavigna S, et al. MicroRNA-423-5p Promotes Autophagy in Cancer Cells and Is Increased in Serum From Hepatocarcinoma Patients Treated With Sorafenib. Molecular therapy Nucleic acids 2015;4:e233. Xiao J, Zhu X, He B, Zhang Y, Kang B, Wang Z, et al. MiR-204 regulates cardiomyocyte autophagy induced by ischemia-reperfusion through LC3-II. Journal of biomedical science 2011;18:35. Yumioka T, Osaki M, Sasaki R, Yamaguchi N, Onuma K, Iwamoto H, et al. Lysosome-associated membrane protein 2 (LAMP-2) expression induced by miR-194-5p downregulation contributes to sunitinib resistance in human renal cell carcinoma cells. Oncology letters 2018;15:893-900. Huangfu L, Liang H, Wang G, Su X, Li L, Du Z, et al. miR-183 regulates autophagy and apoptosis in colorectal cancer through targeting of UVRAG. Oncotarget 2016;7:4735-45. Cao W, Qian G, Luo W, Liu X, Pu Y, Hu G, et al. miR-125b is downregulated in systemic lupus erythematosus patients and inhibits autophagy by targeting UVRAG. Biomed Pharmacother 2018;99:791-7. Turei D, Foldvari-Nagy L, Fazekas D, Modos D, Kubisch J, Kadlecsik T, et al. Autophagy Regulatory Network - a systems-level bioinformatics resource for studying the mechanism and regulation of autophagy. Autophagy 2015;11:155-65. Tsai TF, Lin JF, Chou KY, Lin YC, Chen HE, Hwang TI. miR-99a-5p acts as tumor suppressor via targeting to mTOR and enhances RAD001-induced apoptosis in human urinary bladder urothelial carcinoma cells. Onco Targets Ther 2018;11:239-52. Tsai T-F, Lin J-F, Yang S-C, Chen H-E, Lin Y-C, Chou K-Y, et al. Benzyl isothiocyanate up-regulates MIR-99A-5P and induces autophagy by suppressing MTOR expression in human bladder cancer cells. Urological Science 2016;27:S44. Chou K-Y, Lin J-F, Tsai T-F, Chen H-E, Lin Y-C, Hwang TIS. Forced expression of MIR-30A-5P sensitizes bladder cancer cells to cisplatin via targeting ATG5 and Beclin-1. Urological Science 2016;27:S3-S4. Li X, Chen J, Hu X, Huang Y, Li Z, Zhou L, et al. Comparative mRNA and microRNA expression profiling of three genitourinary cancers reveals common hallmarks and cancer-specific molecular events. PLoS One 2011;6:e22570. Long JD, Sullivan TB, Humphrey J, Logvinenko T, Summerhayes KA, Kozinn S, et al. A non-invasive miRNA based assay to detect bladder cancer in cell-free urine. Am J Transl Res 2015;7:2500-9. Miah S, Dudziec E, Drayton RM, Zlotta AR, Morgan SL, Rosario DJ, et al. An evaluation of urinary microRNA reveals a high sensitivity for bladder cancer. Br J Cancer 2012;107:123-8. Jiang QQ, Liu B, Yuan T. MicroRNA-16 inhibits bladder cancer proliferation by targeting Cyclin D1. Asian Pac J Cancer Prev 2013;14:4127-30. Zhang DZ, Lau KM, Chan ES, Wang G, Szeto CC, Wong K, et al. Cell-free urinary microRNA-99a and microRNA-125b are diagnostic markers for the non-invasive screening of bladder cancer. PLoS One 2014;9:e100793. Nagata M, Muto S, Horie S. Molecular Biomarkers in Bladder Cancer: Novel Potential Indicators of Prognosis and Treatment Outcomes. Disease markers 2016;2016:8205836. Lin T, Dong W, Huang J, Pan Q, Fan X, Zhang C, et al. MicroRNA-143 as a tumor suppressor for bladder cancer. J Urol 2009;181:1372-80. Ratert N, Meyer HA, Jung M, Lioudmer P, Mollenkopf HJ, Wagner I, et al. miRNA profiling identifies candidate mirnas for bladder cancer diagnosis and clinical outcome. The Journal of molecular diagnostics: JMD 2013;15:695-705. Dyrskjot L, Ostenfeld MS, Bramsen JB, Silahtaroglu AN, Lamy P, Ramanathan R, et al. Genomic profiling of microRNAs in bladder cancer: miR-129 is associated with poor outcome and promotes cell death in vitro. Cancer Res 2009;69:4851-60. Wszolek MF, Rieger-Christ KM, Kenney PA, Gould JJ, Silva Neto B, Lavoie AK, et al. A MicroRNA expression profile defining the invasive bladder tumor phenotype. Urol Oncol 2011;29:794-801 e1. Mitash N, Agnihotri S, Mittal B, Tiwari S, Mandhani A. Molecular cystoscopy: Micro-RNAs could be a marker for identifying genotypic changes for transitional cell carcinoma of the urinary bladder. Indian J Urol 2016;32:149-53. Neely LA, Rieger-Christ KM, Neto BS, Eroshkin A, Garver J, Patel S, et al. A microRNA expression ratio defining the invasive phenotype in bladder tumors. Urol Oncol 2010;28:39-48. Zhang ZC, Huang Y, Wang XJ, Wang M, Ma LL. [Expression of circulating microRNAs in patients with bladder urothelial carcinoma]. Beijing da xue xue bao Yi xue ban = Journal of Peking University Health sciences 2013;45:532-6. Zhou X, Zhang X, Yang Y, Li Z, Du L, Dong Z, et al. Urinary cell-free microRNA-106b as a novel biomarker for detection of bladder cancer. Med Oncol 2014;31:197. Egawa H, Jingushi K, Hirono T, Ueda Y, Kitae K, Nakata W, et al. The miR-130 family promotes cell migration and invasion in bladder cancer through FAK and Akt phosphorylation by regulating PTEN. Sci Rep 2016;6:20574. Cui X, Kong C, Zhu Y, Zeng Y, Zhang Z, Liu X, et al. miR-130b, an onco-miRNA in bladder cancer, is directly regulated by NF-kappaB and sustains NF-kappaB activation by decreasing Cylindromatosis expression. Oncotarget 2016;7:48547-61. Song T, Xia W, Shao N, Zhang X, Wang C, Wu Y, et al. Differential miRNA expression profiles in bladder urothelial carcinomas. Asian Pac J Cancer Prev 2010;11:905-11. Friedman JM, Liang G, Liu CC, Wolff EM, Tsai YC, Ye W, et al. The putative tumor suppressor microRNA-101 modulates the cancer epigenome by repressing the polycomb group protein EZH2. Cancer Res 2009;69:2623-9. Eissa S, Matboli M, Hegazy MG, Kotb YM, Essawy NO. Evaluation of urinary microRNA panel in bladder cancer diagnosis: relation to bilharziasis. Translational research : the journal of laboratory and clinical medicine 2015;165:731-9. Jiang X, Du L, Duan W, Wang R, Yan K, Wang L, et al. Serum microRNA expression signatures as novel noninvasive biomarkers for prediction and prognosis of muscle-invasive bladder cancer. Oncotarget 2016;7:36733-42. Pignot G, Cizeron-Clairac G, Vacher S, Susini A, Tozlu S, Vieillefond A, et al. microRNA expression profile in a large series of bladder tumors: identification of a 3-miRNA signature associated with aggressiveness of muscle-invasive bladder cancer. Int J Cancer 2013;132:2479-91. Itesako T, Seki N, Yoshino H, Chiyomaru T, Yamasaki T, Hidaka H, et al. The microRNA expression signature of bladder cancer by deep sequencing: the functional significance of the miR-195/497 cluster. PLoS One 2014;9:e84311. Wei Y, He R, Wu Y, Gan B, Wu P, Qiu X, et al. Comprehensive investigation of aberrant microRNA profiling in bladder cancer tissues. Tumour Biol 2016;37:12555-69. Pence S, Ozbek E, Ozan Tiryakioglu N, Ersoy Tunali N. Deregulation of seven CpG island-harboring miRNAs in bladder cancer: miR-155 and miR-23b as the most promising oncomiRs. Cellular and molecular biology 2016;62:25-30. Majid S, Dar AA, Saini S, Deng G, Chang I, Greene K, et al. MicroRNA-23b functions as a tumor suppressor by regulating Zeb1 in bladder cancer. PLoS One 2013;8:e67686. Wang G, Zhang H, He H, Tong W, Wang B, Liao G, et al. Up-regulation of microRNA in bladder tumor tissue is not common. Int Urol Nephrol 2010;42:95-102. Zhang C, Ma X, Du J, Yao Z, Shi T, Ai Q, et al. MicroRNA-30a as a prognostic factor in urothelial carcinoma of bladder inhibits cellular malignancy by antagonising Notch1. BJU Int 2016;118:578-89. Li H, Yu G, Shi R, Lang B, Chen X, Xia D, et al. Cisplatin-induced epigenetic activation of miR-34a sensitizes bladder cancer cells to chemotherapy. Mol Cancer 2014;13:8. Wang W, Li T, Han G, Li Y, Shi LH, Li H. Expression and role of miR-34a in bladder cancer. Indian journal of biochemistry & biophysics 2013;50:87-92. Pospisilova S, Pazourkova E, Horinek A, Brisuda A, Svobodova I, Soukup V, et al. MicroRNAs in urine supernatant as potential non-invasive markers for bladder cancer detection. Neoplasma 2016;63:799-808. Du M, Shi D, Yuan L, Li P, Chu H, Qin C, et al. Circulating miR-497 and miR-663b in plasma are potential novel biomarkers for bladder cancer. Scientific reports 2015;5:10437. Motawi TK, Rizk SM, Ibrahim TM, Ibrahim IA. Circulating microRNAs, miR-92a, miR-100 and miR-143, as non-invasive biomarkers for bladder cancer diagnosis. Cell biochemistry and function 2016;34:142-8. Hu Z, Lin Y, Chen H, Mao Y, Wu J, Zhu Y, et al. MicroRNA-101 suppresses motility of bladder cancer cells by targeting c-Met. Biochem Biophys Res Commun 2013;435:82-7. Zhang H, Qi F, Cao Y, Chen M, Zu X. Down-regulated microRNA-101 in bladder transitional cell carcinoma is associated with poor prognosis. Med Sci Monit 2014;20:812-7. Yoshino H, Chiyomaru T, Enokida H, Kawakami K, Tatarano S, Nishiyama K, et al. The tumour-suppressive function of miR-1 and miR-133a targeting TAGLN2 in bladder cancer. Br J Cancer 2011;104:808-18. Chen YH, Wang SQ, Wu XL, Shen M, Chen ZG, Chen XG, et al. Characterization of microRNAs expression profiling in one group of Chinese urothelial cell carcinoma identified by Solexa sequencing. Urol Oncol 2013;31:219-27. Zhang M, Zhuang Q, Cui L. MiR-194 inhibits cell proliferation and invasion via repression of RAP2B in bladder cancer. Biomed Pharmacother 2016;80:268-75. Zhao C, Qi L, Chen M, Liu L, Yan W, Tong S, et al. microRNA-195 inhibits cell proliferation in bladder cancer via inhibition of cell division control protein 42 homolog/signal transducer and activator of transcription-3 signaling. Experimental and therapeutic medicine 2015;10:1103-8. Zhang Y, Zhang Z, Li Z, Gong D, Zhan B, Man X, et al. MicroRNA-497 inhibits the proliferation, migration and invasion of human bladder transitional cell carcinoma cells by targeting E2F3. Oncol Rep 2016;36:1293-300.